There’s something about risotto that warms the heart. 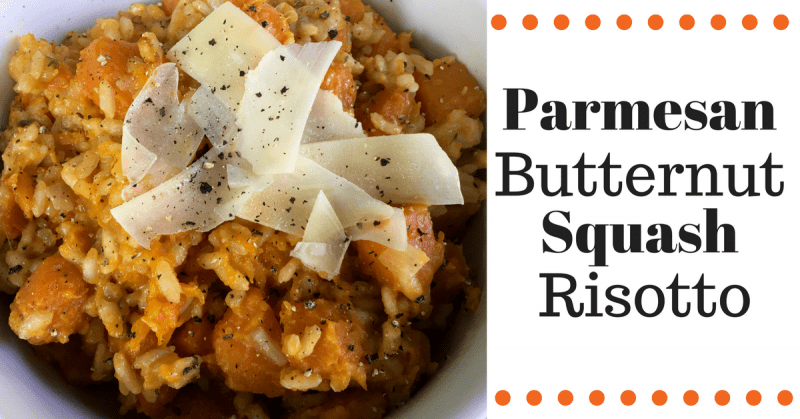 Parmesan Butternut Squash Risotto is the perfect fall dish to welcome a new season into our lives. One of the best places in the United States to see fall foliage is in Vermont. I’ve been privileged to view this natural wonder in person. The recipe for this amazing risotto came from an online news article about Stowe, Vermont showcasing local chefs favorite recipes for fall. I adjusted the recipe a bit for my taste. In a medium pan, saute shallots in 2 tablespoons of olive oil until translucent. Add rice, wine and 1 1/2 cups of chicken stock to the shallots. Simmer on low for 18-20 minutes, stirring every couple of minutes. After the rice as absorbed most of the wet ingredients, set the pan aside and let cool a bit. Add 2 tablespoons olive oil to a large saucepan and add diced butternut squash. Saute squash until they are caramelized and tender, about 10 minutes on medium heat. Once the butternut squash is completely cooked, mix in rice from the other pan, cream and the remaining 1/2 cup chicken stock. Reduce heat to low, and cook until it reaches your desired consistency. You can add a little water if the rice is too hard. Add the parmesan cheese, nutmeg, thyme and season with salt and pepper. Divide risotto between bowls and top with shaved parmesan. Feel free to substitute vegetable stock for chicken stock. Make sure you cook the rice al dente. You don’t want mushy rice. Pick a pot that fits over your burner. You want the rice to cook evenly. By using a too wide pan, the heat is not distributed evenly and will affect the outcome of your dish. Always save the cheese and cream for the end of your cooking process. You don’t want to make your rice gooey by adding the cheese or cream too early. For extra richness, add a tablespoon of butter to the dish at the end while cooking. Saucepan – I use ceramic cookware because it prevents a metallic taste. You can find a set of ceramic cookware here. Aborio Rice – You can find it here. Sharp Knives. I use these ceramic ones.